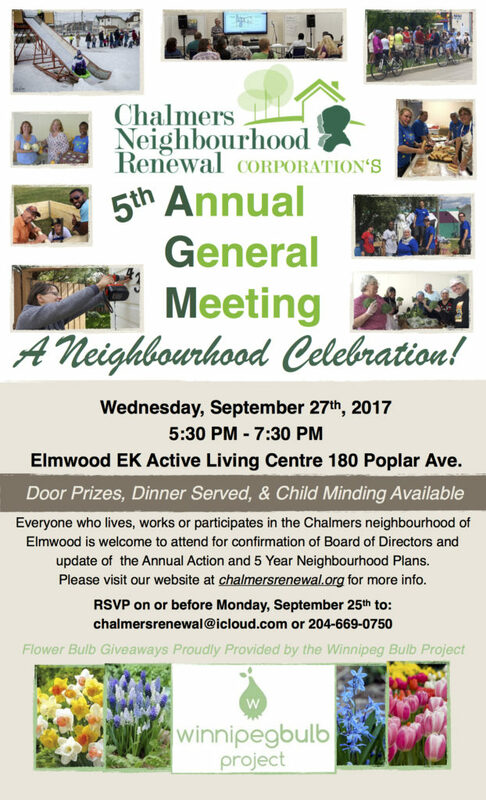 If you live, work or participate in the Chalmers neighbourhood of Elmwood please plan to attend this annual celebration, confirmation of Board of Directors and update of the Annual Action and 5 Year Neighbourhood Plans. Please visit our website at chalmersrenewal.org or contact us for more details. located at Elmwood EK Active Living Centre 180 Poplar Ave.
At the AGM and Community Celebration there will be packages of flower bulbs for people to take home courtesy of the Winnipeg Bulb Project. Individuals commit to: planting their bulbs in a place the broader community will be able to see them bloom, and to share the photos and/or allow the Winnipeg Bulb Project or Chalmers Neighbourhood Renewal Corporation to take photos of the flowers blooming in the spring. The Winnipeg Bulb Project, through the generous support of its donors, supplies spring-flowering bulbs to charities and homeowners in lower-income neighbourhoods. To donate to the Winnipeg Bulb Project please click here. To learn more, check out a previous year’s AGM Video – all about the 6 neighbourhood priorities!